Best time to GO: Anytime. Being an upper Midwest destination, every season has its unique appeal. While downhill and cross-country skiing rule the Winter in Northern Minnesota, this post highlights the best of the North Shore before the snow falls and after it melts. For cold weather exploration and even more great places to stay, see our Winter Activity Guide. The closet major airport to this area is in Duluth (DLH), with daily flights from Minneapolis and Chicago. The alternative is to drive north on 35 from Mpls / St. Paul and follow hwy. 61 along the coast. No matter where you live or where you've been, the vast, untouched beauty of the North Shore will astound you. 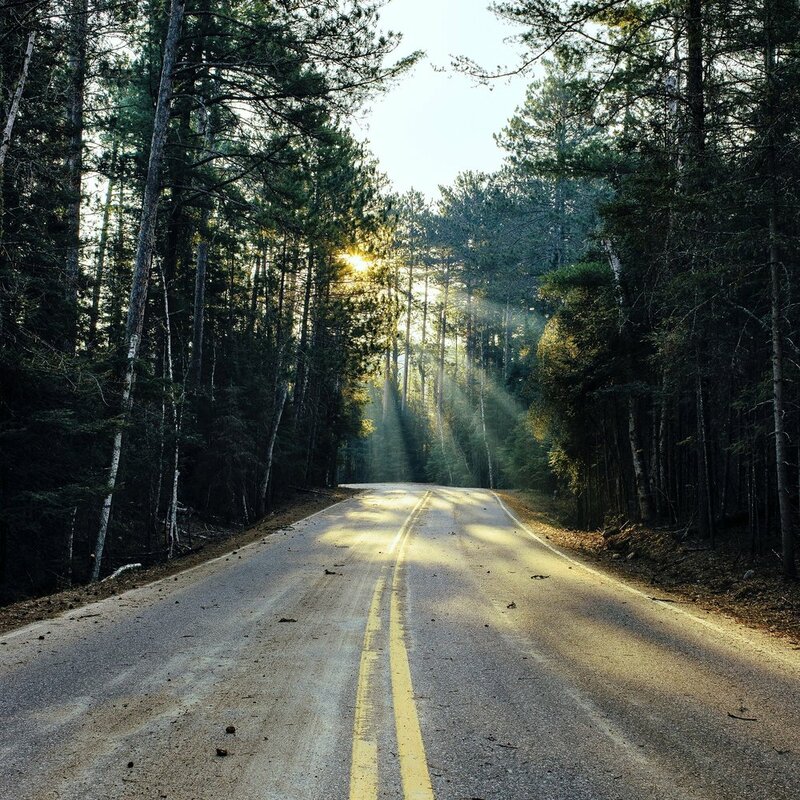 The North Shore Scenic Drive is a 145 mile route that hugs the shores of the world's largest freshwater lake. This coastal thoroughfare starts at Canal Park in Duluth and ends in Grand Portage, Minnesota, near the Canadian border. The spectacular scenery of Lake Superior's beautiful North Shore includes the Sawtooth Mountains, magnificent waterfalls and thousands of acres of pine, aspen and birch trees. The breathtaking journey along the lake shore will take you through 8 state parks, past historic lighthouses and into the most unique shoreline towns. These suggestions are central to the expansive area that is Minnesota's North Shore. If you are looking to stay in Duluth check out one of our two Roam Guides to Duluth. This treasure trove of beauty right on the flat rocks of Lake Superior is family owned and very affordable. They offer 15 unique cabins that can accommodate any size group. We love the Pine Stuga cabin in any season with it's multiple sundecks and sweeping vistas. One stay here and you'll be planning a return visit. As Minnesota's oldest historic resort, this lodge is the definition of North Shore hospitality. It sits on a private cove, offers countless activities, all the expected amenities, and a variety of accommodations spanning town homes to cabins. The Poplar River Condos are wildly preferred for their privacy, while still allowing a nice proximity to the main lodge for live music and bonfires. If you are bringing your 4-legged friend, consider the Sea Villas which are situated as close to the lake as you can get. Incredible! Rentals on the North Shore can be hit or miss, but this newly built cabin for 10 is secluded and peaceful with partial views of the lake. The home has great outdoor space, a fireplace and comfortable linens. This is the kind of place that immediately feels like home. 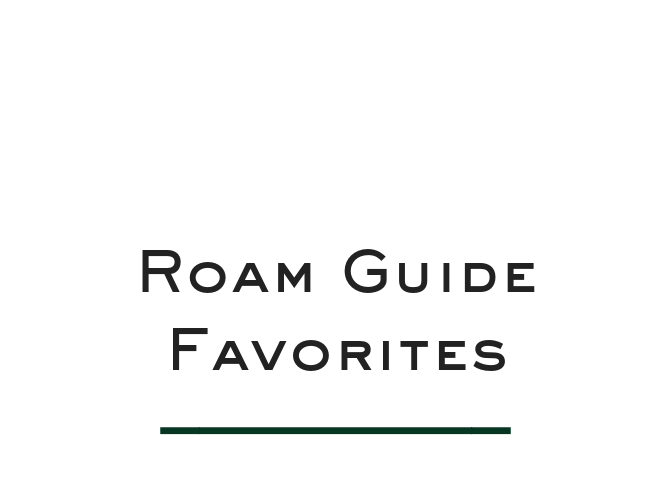 See additional home rentals here or to find our favorite VRBO recommendation on the north shore check out our Winter Activities Roam Guide, under skiing. Rtip: Just because we love The LowBrow Restaurant in South Minneapolis, we feel compelled to also share their great North Shore Cabin just 3 miles from Tettegouche State Park and 1/2 hour from Lutsen Mountains. You don't have to be a seasoned Northwoods camper to enjoy Tettegouche State Park. In fact, instead of cooking over a campfire, you can even order pizza to the campground from Jimmy's. The 'cart-in' sites with views of the lake are preferred as they are a bit more secluded. This area offers nearby beach access and is only a short walk to the Baptism River- a perfect place to take a dip. A little further north, and highly recommended for camping is, Lambs Resort. Read all about this special property in our featured post on The 5 Best MN Campgrounds. Sugarloaf Cove Nature Center offers geology walks, classroom exhibits, literature, and educational programs. At a minimum you should take the one-mile interpretive hike through the forest, over rocks that are 1.1 billion years old. This is a great opportunity to connect with nature, enjoy the dense trees, birds, wildflowers, and of course enjoy the breathtaking views of Lake Superior. Be sure to make time to explore Sugarloaf's beautiful beach, tucked in a natural cove, with a never ending supply of skipping rocks. North House offers over 350 courses from cabin timber framing to sausage making. The course instructors are kind, patient, skilled and dedicated experts of their craft. Over the years, our family has taken countless inter-generational courses. 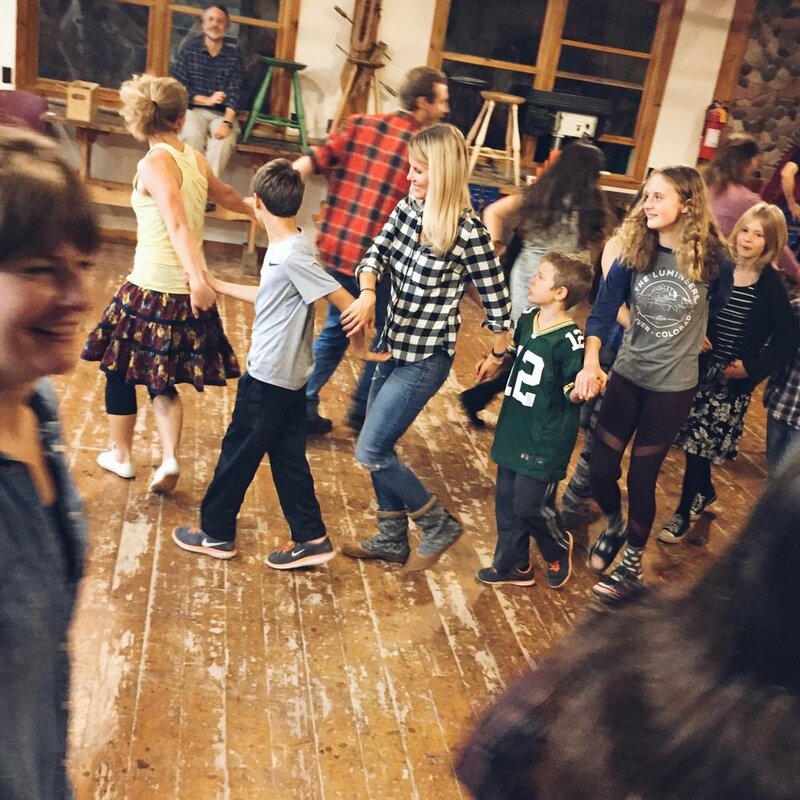 Although classes are offered year around, The Family Weekend in the Fall is our favorite with live music, Contra Dancing (pictured below) and a student Pizza Potluck. Everyone brings pizza toppings to share and the North House supplies the dough and wood-fired oven. Always a great experience that provides lasting memories among a wonderful community of people. Want a unique way to experience the North Shore? Learn to rock climb with Spirit Guiding Adventure's passionate and kind owners, Matthew and Lindsey. They work expertly with both beginner and experienced climbers of all ages (Matthew is incredible with kids), offering professionally guided rock climbing trips along Lake Superior. If you are visiting in the winter and don't downhill ski, consider discovering the beauty of the North Shore on one of their guided Cross Country Ski or Snowshoe tours. All so fabulous! So many hikes, so little time. With all the paths to take in this stunning wilderness, you must get out there and explore. Here are a few suggestions; Temperance River Hiking is a must for North Shore visitors of all ages. From Temperance you can take a quick walk to see Cauldren or "Hidden Falls," to enjoy four sets of flowing water under the most incredible cedar trees. Another more challenging hike takes you from Temperance to Carlton Peak. A third option is the Cascade River Loop, which is a more moderate hike beside the water. If you are looking for an easy stroll along the shoreline or through the woods, try Pebble Beach, which is 12 miles northeast of Grand Marais on Highway 61. Where ever you end up, make a stop at Sawtooth Outfitters for hiking maps and great local advice before you head out. RTip: If you are interested in exploring the waterfalls like Gooseberry or Thompson Falls, pictured below, check out the Cook County website to find the right one for you. To really enjoy the vastness and clarity of this gorgeous lake, you should book a day trip paddling along Lake Superior's rugged coastline with The Duluth Experience. If you only have a few hours, consider a half-day exploration through the picturesque coves and inlets on the St. Louis River. Their outdoor adventures are an exhilarating experience designed for all skill levels and their guides are both knowledgeable and friendly. We absolutely love what they are doing at this tour company. RTip: If you want to stay dry, consider an immersive urban adventure like the Duluth & Beyond Brewery Tour, a VIP sampling experience that highlights the North Shore craft beer scene. Head to the Temperance River State Park, Beaver Bay or Paradise Beach (to name a few) and sift through the rocks. You might just find an agate. Once you discover a one-of-kind lined agate or a piece of a lake polished glass, you might be there awhile. Kids love the heart-shaped stones and “pretty” rocks. Some go home as special gifts and some stay in the garden near your cabin, tent, or camper. If you get really serious, stop in to Rons World Rocks in Grand Marais. He crafts jewelry in sterling silver, sells all kinds of rocks and gems and loves to share what he knows about your special treasures. This traditional ski resort in the Sawtooth Mountains offers an alpine slide during the off-season. Take it slow or race a friend down Eagle Mountain in your sled. It's such a fun activity for all ages, kids under 5 are free, and passes can be purchased onsite. For an equally thrilling ride, take the Summit Express Gondola to the top of Moose Mountain and take in the panoramic views of Lake Superior. The Summit Chalet offers lunch and beverages on their mountaintop deck. RTip: For all kinds of great restaurants in the Duluth area, check out our partner post with Duluth Pack. There is nothing better then fresh caught fish! Stop at Dockside Fish Market and enjoy bluefin herring, lake trout, whitefish and Canadian walleye straight from Lake Superior. We suggest the fish and chips, and the fish chowder of the day, it's worth the stop. Oh, and don’t forget to grab some smoked salmon to-go, it’s delicious. In the summer it's best to grab a spot on the patio and just let the kids play on the beach or skip rocks on Lake Superior. While you wait, you can munch on the Smoked Fish Platter. They often have live music in the bar area, and long-time bartender Mike mixes a great drink. In the winter months cozy up inside and order a bowl of the Duck and Wild Rice Chowder. Fresh fish with a view is good in any season. RTip: consider staying at a Bluefin property, they offer fantastic activities and events for their guests, including guided hikes, canoe trips, yoga, a winery shuttle and nightly smores on Bluefin Bay beach, just steps away from Lake Superior. Want more fresh fish? If you have not had the pleasure of enjoying Angry Trout's Catch of the day, you must. If fish is not your thing, they also offer Bison, Chicken and everything in between, including a house-made veggie burger. They don't take reservations but you can call ahead to get on the list. If the wait becomes lengthy, we suggest you sip on a local beer and enjoy the incredible harbor views. Another Bluefin owned restaurant, the CoHo is cozy, inviting and serves food all-day. Homemade baked goods, great sandwiches and delicious pizza. If you like sausage try the "Call of the Wild.' Their menu is available to-go, so you can take your lunch to the nearby Tofte Park, grab a picnic table and listen to the waves. There are lots of places to grab pizza on the North Shore. If you're in Duluth, find the Log Home Wood Fired Pizza truck every Friday at Bent Paddle Brewery and on Wednesdays at the Glensheen Beach Club, Duluth's only bar on the lake! 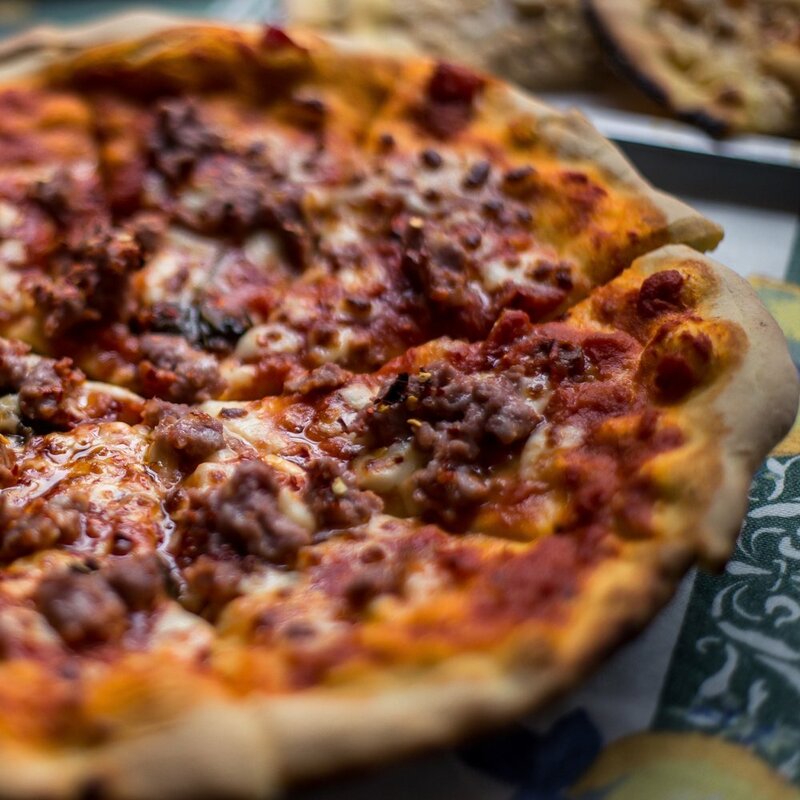 In Tofte, sit with locals at the Birch Grove Pavilion, every Wednesday June to September to enjoy a wood-fired pizza made with Canadian dough from Brule Creek Farms. Just bring a donation and the toppings of your choice. Rtip: If you are heading to a pizza bake and need to bring your own toppings, stop at the Tofte General Store and buy the 'Call of the Wild' in bulk. It's Italian Sausage mixed with Wild Rice- and it's delicious. The same sausage used at the Coho Cafe, mentioned above. You just need a pan to cook it in before you go. 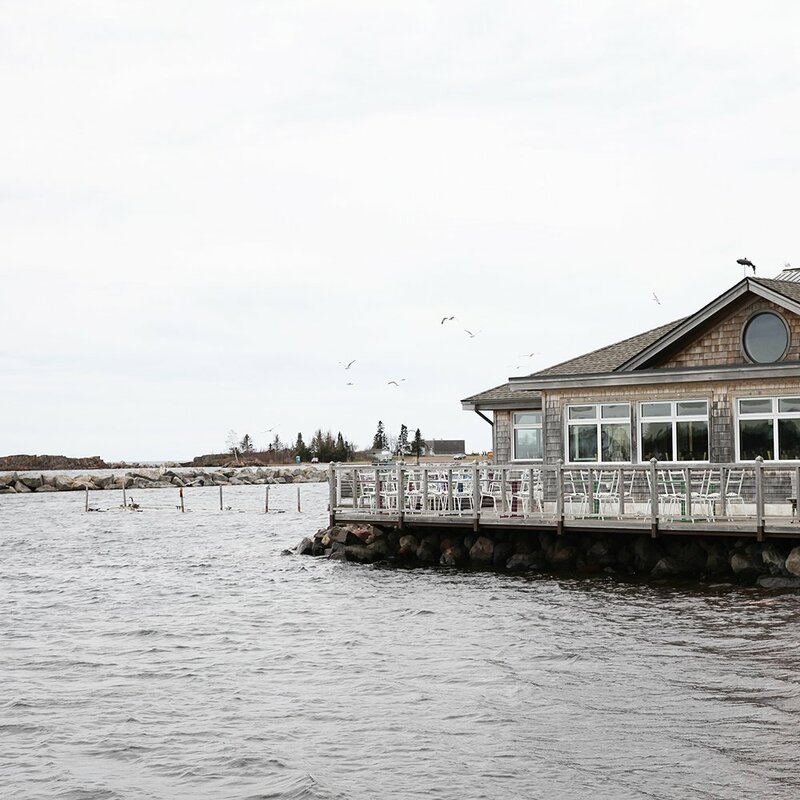 If you are traveling further on the North Shore check out Sydney’s on Artists Point in Grand Marais for wood-fired pizza, ice cream and an one-of-a-kind view. For a good pint of craft beer, we love Castle Danger near the landmark Split Rock Lighthouse. It's kid & dog friendly with fantastic outdoor spaces, games to keep you entertained and occasional live music. They offer a few snacks for purchase, but encourage you to bring your own food. Our suggestion is to grab take-out from a local restaurant like Do North Pizza. On Fridays through the Fall, El Oasis del Norte food truck makes the trek from Duluth to serve up delicious authentic Mexican Food at Castle Danger. Located in Grand Marais, on Hwy 61, Voyageur Brewing is the perfect spot to grab some grub and a flight of beer. The tap room is family-friendly, offers games to keep everyone occupied and delicious small plate food options. We suggest the picnic board full of meat, cheese and crackers. If you are visiting in the Summer they have a fantastic roof-top patio that is dog-friendly. In the winter you can play a board game while you warm-up in front of the fire. Rtip: For more craft beer options on the North Shore, check out our Duluth Roam Guide. Using California grapes and Minnesota apples, this place has figured it out. They too have great indoor & outdoor space, offer live music on Sundays, and "date night" Thursday's. Honestly, this winery and cider house is a wonderful addition to the North Shore. Not to be forgotten, they offer artisan cheese, salty meat and crackers to enjoy while you sip away an afternoon in the sunshine. If you have a sweet tooth, or one in the car, this candy shop is a hit. It's an adorable stop, full of handmade treats from third generation candy makers. Load up on sugar and follow the artist designed 'Bear Trail' in the wooded lot next door for a kitschy photo-op the kids will remember. If you love flavored coffee, this place is your new "go to." The Boundry Waters Coffee sold here is exceptional. We suggest the chestnut, whole bean and lots of it. Beware it's expensive and if you want to buy more than a pound you may have to put your order in and wander back for it in later. Whatever you need to do, don't leave town without a pound of BWC. 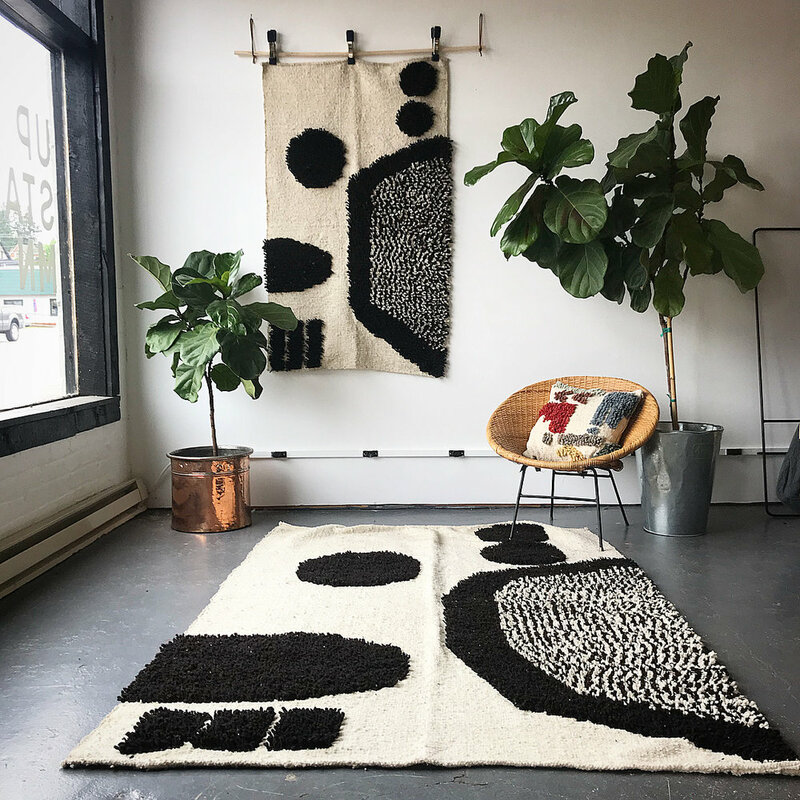 The adorable owner, Kristopher has curated a beautiful store that combines his love of design and his support of emerging artists. In his own words, 'The brick and mortar has the main goal of connecting to humans and rippling love out into the world.' How endearing is that? Stop by and see this gem of a shop next time you're in Grand Marais. First of all, a towel is a great thing to always have in the car, and everyone needs a "heading North" baseball hat from Live and Love MN. You also need to bring a good pair of waterproof shoes or boots for exploring. Although if you forget, lose or ruin your shoes, Ben Franklin in Grand Marais has you covered. They have a surprisingly wonderful selection. As with all Midwest locations by the lake, bring layers. It can get chilly, even in the middle of summer. Want more of the North Shore? What are we missing? Tell us your favorite stops on the North Shore in the comments below.